He appeared as if he didn’t hear anything. After a pause, he spoke again, “You don’t want to look at me? Sure, then. I’ll just start talking. It was my fault during that night. I was wrong. I shouldn’t have climbed the wall, I shouldn’t have drank alcohol, and I shouldn’t have fought with you. But, I swear! It wasn’t that I provoked you on purpose—I really didn’t look at the sect rules. The sect rules in the Jiang Sect are all told verbally; none of them are written down. Or else, I definitely wouldn’t have done that.” I definitely wouldn’t have finished the jar of Emperor’s Smile in front of you. I would have tucked it away and carried it back into my room, secretly drinking it every day and sharing it with everyone until we all had enough. Lan WangJi put his brush down. Wei WuXian thought that the other couldn’t endure it any longer and finally wanted to beat him up. Just as he got ready to put on a goofy grin, he discovered that his upper and lower lips seemed like they were glued together, so he couldn’t laugh. Lan WangJi closed his eyes and let out a faint breath of air. When he opened his eyes, the calm expression returned again. He picked up the brush again, as if nothing had happened. Wei WuXian had been aware of the hated silencing spell of the Lan Sect since long ago, and he refused to believe it. Yet, after making every effort, scratching the corners of his lips red, he still couldn’t open his mouth no matter what. And so, he grabbed a piece of paper, wrote as if his brush was flying, and threw the paper over. Lan WangJi glanced at it. “Pathetic,” he responded, crumpling it into a ball and tossing it away. Wei WuXian was so angry that he rolled around on the mat, climbed up, and wrote another one, slamming it in front of Lan WangJi. Again, it was crumpled into a ball and tossed away. The silencing spell was only removed after he finished copying. The second day, when he came to the Library Pavilion again, the balls of paper which landed everywhere were all taken out. Wei WuXian had always forgot about the pain after the cut healed. Although, on the first day, he suffered greatly from the silencing spell, after a few moments, his mouth started to itch again. After recklessly speaking a few times, he was silenced once more. He couldn’t open his mouth, so he scribbled on paper and pushed them to Lan WangJi, who crumpled it and threw it onto the ground. The same thing happened on the third day. He was silenced time after time. However, on the last day of him having to “face the wall and reflect,” Lan WangJi noticed that Wei WuXian seemed somewhat different. During his stay at Gusu, he left his sword all around the place, and was never seen carrying it properly. Yet, he took it with him today, loudly slamming it onto the desk. He even went as far as to start writing without a word, contrasting his usual behavior of relentlessly harassing Lan WangJi in every way possible. He was so obedient that it was strange. Lan WangJi didn’t have a reason to silence him, so he took a few more glances at him, as if he didn’t believe that Wei WuXian was finally willing to behave himself. As he had expected, after a short while of sitting down, Wei WuXian repeated his past conduct again, giving Lan WangJi a piece of paper for him to see. Lan WangJi originally thought that it was going to be a mess of lame phrases again, but after a coincidental glimpse, he was surprised to find the drawing of a person, sitting upright and reading by the window, with a vividly realistic expression on his face. It was himself. Seeing that he didn’t avert his gaze at once, Wei WuXian curled his lips, and raised his eyebrow with a wink. No words were needed, since the meaning was plain to see—Does it look like you? Is it good? After his words, he picked up the paper and his brush, and added a few strokes. He glanced at the drawing, then, the actual person, and fell toward the ground in laughter. 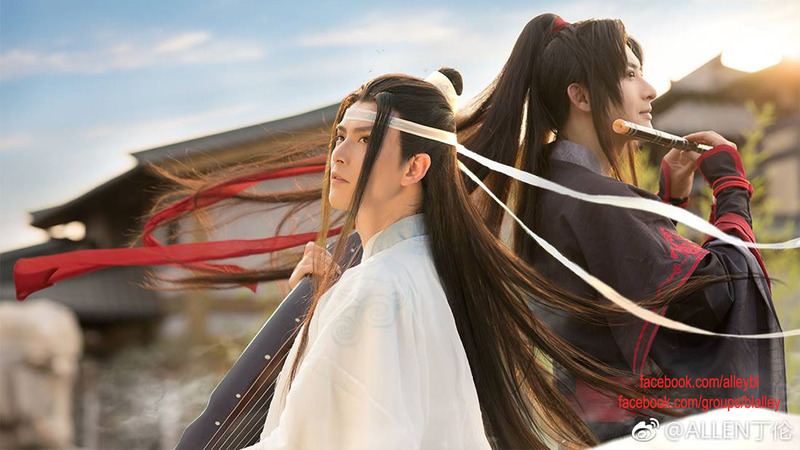 Lan WangJi put down the book, and saw that Wei WuXian added a flower onto the drawing, where the side of his head was. Lan WangJi turned his gaze away, picked up the book which he put on the desk, and opened it again. He only took one look at before he hurled the book away, as if he was burnt by fire. He was initially reading a Buddhist text, but when he had looked at the page flipped open, he was presented with naked, intertwining figures, intolerable to his eye. The book that he was reading was substituted with a pornographic book, its cover disguised as a Buddhist text. Lan WangJi filled his right hand with spiritual energy, and the book broke into thousands of millions of pieces, fluttering downward. As Wei WuXian saw that he successfully provoked Lan WangJi to the point that the evidence was destroyed, he finally felt relieved, and spoke with fake regret, “What a waste!” Then, he picked up a piece of paper which had fallen on his hair, raising it up to show the fuming, pale-faced Lan WangJi, “Lan Zhan, everything about you is great, except that you like to throw things everywhere. Tell me, how many wads of paper have you thrown onto the ground, in these past few days? Today, you aren’t even satisfied with throwing paper wads anymore, and instead ripped paper. You ripped it, so you clean it up yourself. I’m not gonna help.” Of course, he had never helped anyway. 1 . To see the clouds disperse and the moon appear means to finally see results after being patient and waiting for a long time. 2 . The nickname “Second Brother Lan” will appear quite a lot of times in the future. The literal translation is “Second Older Brother Lan”, and is meant to be said in a jokingly way. In China, calling someone an older brother, especially for girls towards guys, is usually meant to be flirtatious. The word meaning “older brother” in Chinese is gege, and people (specifically readers of Heavenly Blessings) often describe it as having a soft, dough-like undertone to it, sounding like a little girl as one speaks. The end of the phrase swishes upwards, as if it’s a smooth, flowing ribbon tugging at one’s heartstrings. In simpler terms, this sounds like oppa in Korean or onii-san in Japanese. 3 . To forget about the pain after the cut heals means that one quickly forgets about the things they should’ve learnt from a punishment.